While myself and Rawk have always dominated our banter no matter what chat medium we've used, Discord has brought some much-appreciated balancing factors. Kamek is talking significantly more. Wendy is talking, period, because she previously refused to use AIM. Vortex... well, he's not around much because of his own problems he's chronicled here below the song. Point is that our staffer engagement is up, which is what makes things like yesterday's proposal for a Kamek-Rawk collab article (I'm going to make sure they don't forget this, and you should too) possible. The KoopaTV audience's view into our instant messaging, the Reaction Logs, have become more lively since going to Discord. That means more text for you to read and enjoy, even for short events like the five-person log for the Animal Crossing: Pocket Camp Direct, which was a record. Discord is designed to give the same, consistent experience whether you use its browser site, its mobile application, or its downloadable program. This makes it highly desirable for our on-the-go staffers, so they can be connected to us without feeling like they have to bring themselves through crap. 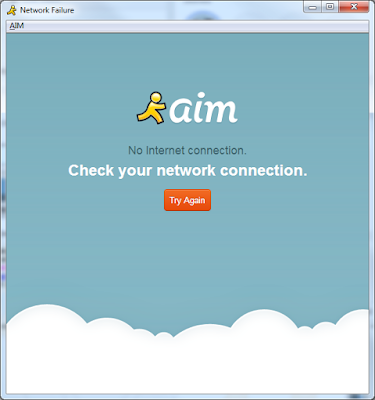 AIM's mobile app was awful, as was its web application and its desktop program once they forced everyone to upgrade to the newest version. We very quickly filled up our 50-custom-emoji limit, currently sitting at 49. Almost all of these, including that idiotic dab one, get regular usage. Ace Attorney has 11 out of 49, and the Mario series has 12 out of 49. This roughly reflects our priorities. All in all, moving to Discord was a much-needed step for KoopaTV, an organisation that is famous for its antiquated look & feel. That doesn't necessarily mean the way we communicate with one another also has to be ancient! We can be the agile dot-org that you deserve as a reader. It's a shame what happened to AIM, but I admit it was holding us back. Discord having an actually active development team that could fix some of the problems we pointed out is a big positive, unlike AIM which was abandoned many years ago. If you have feedback to give to KoopaTV about our Discord, answer the questions in KoopaTV Feedback Form Part XIII. ...Even if you don't have any feedback on that, there are other questions that directly impact our site content, so we'd love to hear from you. It gives you big-league points in the KoopaTV Loyalty Rewards Program, as does KoopaTV's current quiz accessible from the same page! ...Don't count on more reminders from me for the rest of December. Ludwig blames Verizon for AIM ending, so he's not pleased when people call him an ISP stooge for his stance on net neutrality. The Koopa Keep server's custom emoji list is subject to change after this was published, and was in the discussion of being changed while this was being written. If you're wondering who uses the dab, it's Kamek's go-to emoji. Discord won KoopaTV's Best Communications Platform of 2017 award! I recognize all the emojis except for the first two and the last on the first row. Also, I was actually expecting more Ace Attorney than anything else, but the dab unfortunately gave the plumbers a slight advantage. 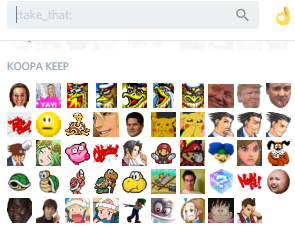 Discord truly is great at customization. It would be nice if it was brought over to the Switch instead of the complicated voice chat system that is used right now. Second one is :yay: from 3DS eShop game Tokyo Crash Mobs. The last one on the first row is Bill Trinen called :trinen_donuts: because I guess he's eating something. Discord has expressed interest in working with Nintendo for the voice chat. You'd never see AOL do that. WOuld be cool to be part of your Discord server but I guess it is for KoopaTV employees only. Well, Wendy set it up so there is technically a staff-only category and then a general "plebs :p" category, so she's left it open that we could invite the general public. I think it's counterproductive, because I'd rather have people comment on www.KoopaTV.org than via Discord, which is wot would end up happening. Let me know whenever you accept plebs. It'll have a greater than non-zero chance of happening if you convince one of the staffers it's a good idea. I would socialize with the other staffers more often. The fact they're not socialising right now is their fault, not yours. Anyway, initiatives typically need an internal champion, and it sure won't be me. The move towards a more open messaging service, simply by design, will certainly garner positive feedback from your users, and I'm sure it already has among the readers. As for me, I'm open to engaging towards users with similar interests as mine, so Discord is up my ally. Although, notifications continue to be a flaw, as you said when discussing the negatives of the software. I'm glad that having an AIM account is no longer an obligation for those looking for a job at KoopaTV. As you might expect, AIM was used just for the [Koopa Keep] Blast. So for the fringe staffers who were never keen on AIM to begin with, yeah, it was a big ask to ask them to sign-on to AIM just for us, compared to Discord that they'd already be using anyway.